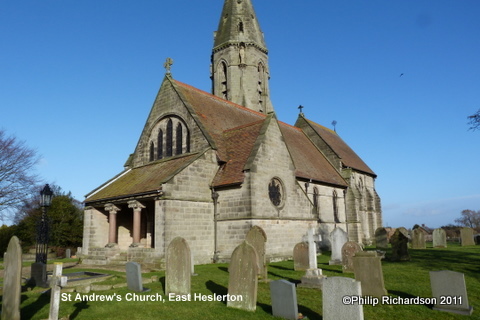 The Church of St Andrew in East Heslerton was built in 1877 and is notable for being a complete survival of a George Edmund Street design without alteration and with fittings intact. The nave has a curious west porch partly supported by two granite columns and the north with its belfry and spire is adorned with four statues originally made for Bristol Cathedral. The stained glass in the church includes the delightful Creation scene , which is almost hidden by the organ, and, in the west window, the Nativity.